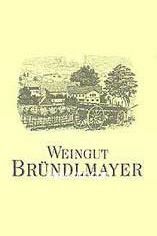 Willi Bründlmayer is widely recognised as one of Austria's most gifted winemakers. 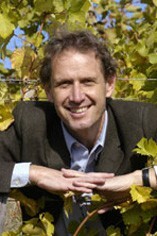 He is best known for his Rieslings and Grüner Veltliners, although he also makes very high quality Chardonnays. He has 57 hectares of vineyards, superbly sited high up on slopes around the wine town of Langenlois. His best site is the Heiligenstein vineyard where the rocky granite/slate soils produce Rieslings of astonishing mineral intensity, which age beautifully. 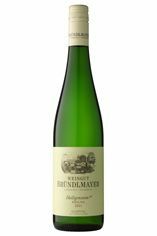 A blend of Chardonnay and Pinot Noir, with a little Grüner Veltliner, this wine has biscuity autolytic notes on the nose, with lovely aromas of apple and lemon. 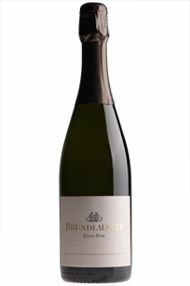 The palate is dry, refreshing and mineral, with cool citrus and apple fruit concentration, a fine, silky mousse, and a lingering finish. The time on lees adds layers of complexity and texture. The Riesling vines of the Steinmassel vineyard grow on primary rock with mica-schist. This geological formation of Austria’s southern forest district possesses as classic and traditional a soil type as one is likely to find anywhere Kamptal, Kremstal or Wachau. The meagre, stony soil provides small berries with concentrated flavor. 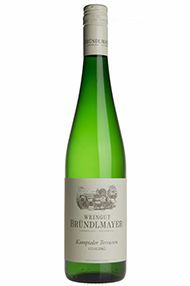 As far as Riesling is concerned, an important part of the flavor is stored in the grape skins and is set free only by extremely slow pressing of up to 8 hours duration or prolonged skin contact over night. Fermentation is done in stainless steel and maturation is completed on 5-10% of the lees. The result: lifted, pungent lime (flower)notes & texturely very impressive too, with a racy lemon & lime fruit intensity & raciness. Drinking but will keep. Excellent with Asian flavours, also with marinated starters. The Bründlmayer family owns 12 hectares right in the centre of the Zöbinger Heiligenstein. 10,5 hectares are planted with Riesling, the remainder for experimental purposes with Cabernet (mostly Cabernet Franc). About 20% of the vineyards are trained in the Lyra trellis system. The other Heiligenstein vines are raised by the traditional Guyot method with the berries hanging 50-60 centimeters above the ground. Thinning is done as required to restrict the average yield to 35/40hl per hectare for this classic (Kamptal DAC) Version. From a geological point of view the Zöbinger Heiligenstein site is not only the oldest but probably also the most interesting on our estate: the soil consists of approximately 270 Mio years old Perm desert sandstone. The sediments contain volcanic inclusions and carbonized remains of primeval vegetation. The uniqueness of this soil, its perfect gradient and position (SW to SE in a climatic borderland) provide ideal preconditions for growing outstanding vines. During the day warm winds (often due to the effects of the Pannonian Climate) drift along the site whereas by nightfall cool gusts from the North start blowing through the Kamp Valley and bring forward the aromatic expression of the grapes.Late harvested healthy grapes are necessary for this classic Kamptal DAC style. The must is fermented in stainless steel at a temperature of 15-20° celsius. After fermentation the wine was partly racked into big wooden casks to mature for a short period on the fine yeast. Excellent with freshly cut porcini, this bright, composed Riesling has the soft suave quality one associates with the best of Kamptal, underpinned by a neat sapidity; it rings with sunny comice pear prettiness.Drinking now but should improve over the next decade.